Can you work out problem #11 of section four in Official SAT #5? Sure. The math concept you need to know here is that perpendicular lines have negative reciprocal slopes. For example, if one line has a slope of , then a line perpendicular to it must have a slope of . In this case, none of the lines are given to you in slope-intercept form, so your first step should be to put at least the first line you’re given into that form. That tells you that the slope of the given line is , so the slope you need to find in the answer choices is . They do you a real favor in the answer choices by only using 3 and 2 as coefficients together in one choice. So just from the get-go you should be leaning choice A. Let’s just put it in slope-intercept form to be sure. Yep, that’s what we wanted. We’re all done! Note that f(x) is a line in slope-intercept form, where a is the slope and b is the intercept. That’s still a line, but now the slope is –2a. You’re translating from words into math here. Key words to note: “at a constant rate” means you’re dealing with something linear, that has a slope. And “decreased at a constant rate” means you’re looking for a negative slope. Because the function is a function of t, years are your x-variable and and millions of barrels is your y-variable. Calculate the slope from the numbers the question provides: 4 million barrels in 2000 and 1.9 million barrels in 2013. Note that while no answer choice has that slope in that exact form, choice C is equivalent. .
Because all the answer choices have the same y-intercept of 4, you need not think much about it, but it does make sense given the question. There were 4 million barrels in 2000 and t represents years after 2000, so t = 0 when the y-variable is 4. 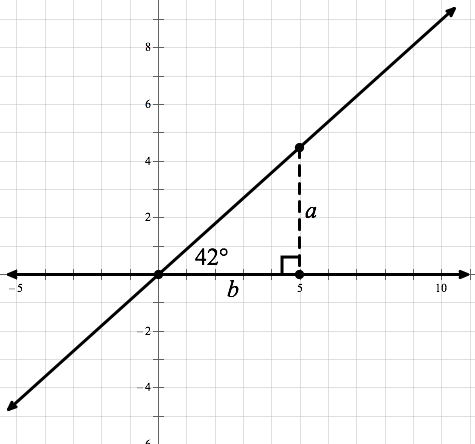 The graph of a linear function f has a positive slope with intercepts (a,0) and (0,b), where a and b are non-zero integers. Which of the following statements about a and b could be true? It helps to do a bit of drawing here. 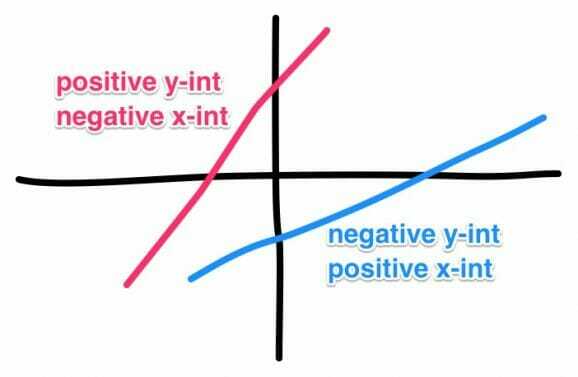 Lines with positive slopes (that don’t pass through the origin) will always have either a positive y-intercept and a negative x-intercept, or a negative y-intercept and a positive x-intercept. Therefore, you can eliminate choices B, C ,and D because in those answers, nonzero integers a and b must be the same sign. (Choice D goes further than B and C, requiring a and b to both be positive.) Choice A works because if a and b are nonzero, then they must have opposite signs for a + b = 0. All we really need to do to nail this question is match a table to a linear function. Unlike some similar questions, the table isn’t labeled with variables and the values aren’t sorted in ascending or descending order, but those are just details! We don’t need to get too creative here; let’s just backsolve through the choices and see which one works best. Remember that r represents the monthly rental price (the rightmost column) and p represents the purchase price in thousands (the middle column). Huh. That’s pretty good! To make sure D is the answer, let’s try a couple other rows of data: Driftwood Drive and Edgemont Street. Both are perfect! That’s enough to satisfy me. D is the answer. Fun fact and major shortcut: when a line passes through the origin, the coordinates of each point are in the same ratio. For example, if you knew a line passed through (3, 6) and (30, 60), you’d know that line passed through the origin. That’s because when a line passes through the origin, its equation will simply be y = mx + 0, or simply y = mx. Put another way, y will be directly proportional to x. Of course, because there are no negative answer choices, we choose C for 8. 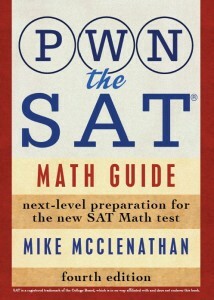 The other way to go here would be to backsolve by just trying to draw the points. You can cross off A right away because any line that goes through (2, 0) and (0, 32) can’t also go through the origin! Even a rough drawing should convince you that the line containing(2, 16) and (16, 32) doesn’t go through the origin. Things get a little trickier with (2, 4) and (4, 32) because it might look CLOSE, but hopefully the right answer looks even closer. 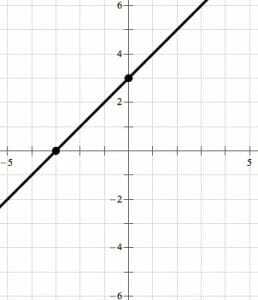 The graph here is definitely a linear relationship between h and C, so we’re going to want to figure out the slope and the C-intercept. Then we’ll use the standard slope-intercept formula, only for this problem it’ll be . Slope is rise over run, or the change in the vertical variable divided by the change in the horizontal variable. 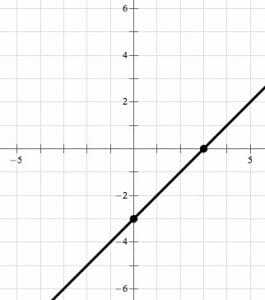 Let’s pick two points from the line and plug them into the slope formula. How about (1, 8) and (3, 14)? Once we have the slope, we’re actually done because whoever wrote this question wasn’t very tricky with the answer choices. The C-intercept of this graph is obviously not zero, and only choice C has the slope we just calculated plus a non-zero C-intercept. 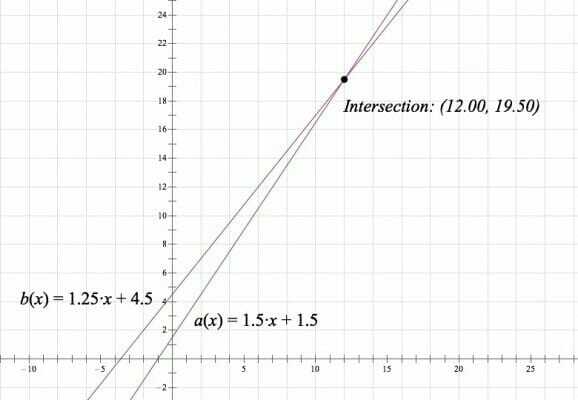 Sure enough, a quick glance at the graph confirms that the C-intercept is 5, meaning the equation should be . I love this question. See how the given line is going through the origin? That means that all the other points on that line will have the same ratio of t to s! That will hold for all other points on the line! * If the point (s, t) is on this line, then the ratio of t to s will be 2 to 1. Because you’re told that (1, 4) and (2, 0) are on the line, you can easily calculate its slope! 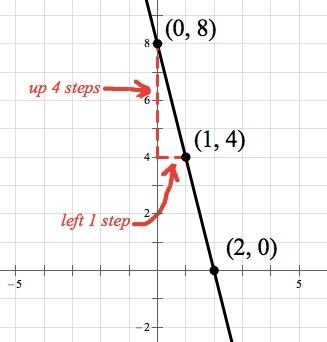 From there, just use the points you know and the slope to count steps back to the y-axis. It’s only one step! From (1, 4), a slope of –4 tells you that you go up 4 steps when you go left 1 step. That lands you on (0, 8). Therefore, b = 8.